According to recently-published data from the Census Bureau, businesses in the construction sector depend on multiple sources of capital for financing start ups and expansion plans, especially sources that are closely connected to the owner’s (or owners’) assets. Furthermore, the data show that construction sector business owners tend to work long hours in order to keep their enterprises successful. The data come from the Census Bureau’s 2007 Survey of Business Owners Public Use Microdata Sample. While slightly old, the data allow for closer scrutiny of business characteristics than do the standard published tables. For example, we used the data to examine the construction sector in detail across several different financial and demographic characteristics. From IRS data, we know that the construction sector (both residential and nonresidential) is dominated by small firms. According to the 2008 Statistics of Income data (the most recent available), 195,463 C Corporations filed tax returns, representing about $547 billion in gross revenue. While C Corporations can be a variety of sizes, these businesses generally tend to be larger and have greater access to capital markets. 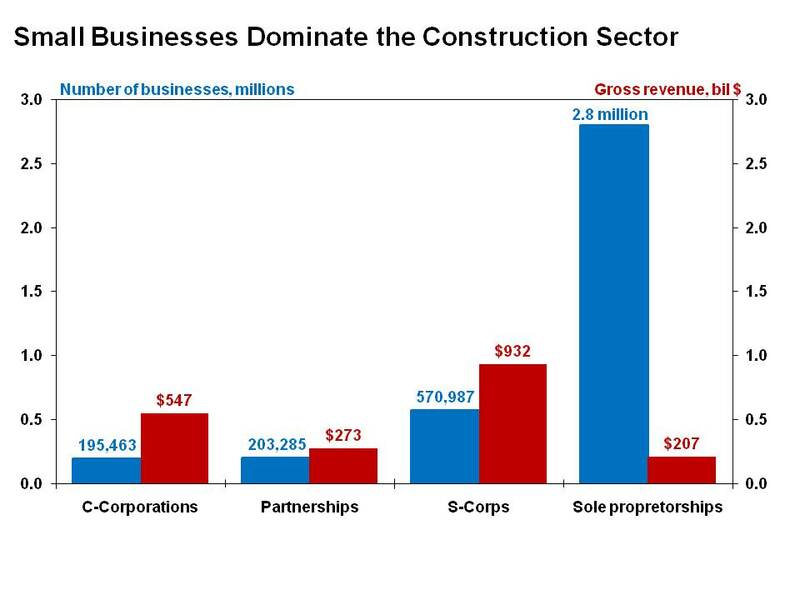 On the other hand, in 2008 there were 570,987 S Corporations in the construction sector, generating $932 billion in gross revenue. Further, there were 203,285 partnerships in the construction sector with gross revenues totaling $273 billion. The most dominant form of business organization in construction, in terms of counts, is the sole proprietorship, with more than 2.8 million Schedule C returns filed in 2008 reporting $207 billion in gross revenue. Overall, the tax data indicate a sector dominated by small businesses, particularly pass-thru entities that report and pay income taxes at individual filing rates. Given this structure of the industry, where do entrepreneurs raise capital to start up their businesses in the first place? The 2007 SBO data indicate that personal savings are a commonly used source of small business start-up capital and more so for the construction sector. A little more than 63 percent of all businesses relied on personal savings as a source of start-up capital, with the share rising to 66 percent for construction firms. Not surprisingly, small businesses, as measured by an employee headcount at the time of the survey, commonly reported tapping personal savings to start their businesses. 67 percent of construction firms with 10 or fewer employees accessed personal savings to start their business, compared to 62 percent for those with 10 to 19 employees, 59 percent with 20 to 49, 57 percent with 50 to 99, and 57 percent with 100 employees or more. Home equity of small business owners is more rarely used for a start-up capital source and was more likely used in 2007 prior to the dramatic decline in housing prices. Nonetheless, the smallest businesses tended to use home equity as a source for start-ups, with firms employing fewer than 20 workers accounting for nearly 92 percent of all firms (construction or otherwise) reporting the use of housing wealth to start businesses. Credit cards played a slightly larger role for start-up capital financing sources than did home equity. The SBO data indicate that 10.6 percent of all firms used credit cards to help with initial funding for their enterprises. The share was even higher in the construction sector, with 12.5 percent of firms using credit cards for start-up capital. Once again, small firms were more likely to use such financing, with more than 13 percent of construction businesses with fewer than 10 employees using credit cards as an initial funding source. For construction firms with 100 employees or more, this share fell to 4 percent of construction. Bank loans are also an important source of start-up capital. The SBO data indicate that 19 percent of all businesses and more than 13 percent of construction firms use bank loans as a means to finance an enterprise’s start-up. In addition, the larger the firm, the more likely they were to use bank loans. In the construction sector, only 12 percent of firms with fewer than 10 employees utilized a bank loan for this purpose, while the rate grew to 17 percent for firms with 10 to 19 employees, 18 percent for those with staff sizes of 20 to 99, and 20 percent for those with 100 or more employees. A necessary ingredient of any successful small business is the owner’s ability to dedicate a significant amount of work/management time. According to the SBO data, this is particularly true for businesses in the construction sector. For all businesses regardless of sector and size, 53 percent of owners reported working more than 40 hours a week. For the construction sector, 59 percent of owners worked more than 40 hours a week. And 23 percent reported working 60 or more hours per week. As expected, the vast majority of primary owners reporting lengthier workweeks tended to operate businesses with fewer workers. Indeed, firms with fewer than 20 workers on the payroll accounted for 91 percent of businesses in the construction sector with owners working more than 40 hours per week. These Census data on businesses once again note that small firms are dependent on the efforts of individuals, and their access to capital, to succeed and create and sustain jobs. This is useful to keep in mind as housing demand grows once again, but credit conditions for some kinds of AD&C financing remain tight. This article was originally published in NAHB’s Eye on Housing Blog.